It’s been a long hot summer here in South Florida. But despite summer being the “off-season,” there isn’t a single weekend without a show on stage somewhere. You might have noticed our “new” old look. After a lot of consideration – and people asking why there wasn’t stuff on the page that has been here all along – we’ve returned to our former template. Everything is in view and easy to find. But you may notice some strange formatting in some articles as we migrate back. And now here’s your Monday reading list. While it IS Labor Day, and a national holiday, and a Monday, there is one theatre that is not actually dark. Actors’ Playhouse is hosting the wedding of local actors Shane Tanner and Amy Miller Brennan. The Miami Herald tells us about a romance that could only happen in theatre. Congratulations, Mr. and Mrs. Miller! Florida Theater On Stage fills us in on the girl playing the title role in the national tour of Annie, which will be opening the Broward Center’s 2014-15 season on October 7. Issie Swickle of Davie has been studying at Broadway Kids Studio. You may recall that another BKS student, Kellie Kessling, took a star turn in Cirque Dreams Jungle Fantasy at the Broward Center back in July. That Michelle Ameerally is doing something right. Talley Sessions is not from South Florida, but he’s played here often. Playbill reports that he’s joined the cast of Holiday Inn at the renowned Goodspeed Opera House. You may be familiar with the Goodspeed: it’s where Annie was born. Not South Florida enough for you? OK, Karl Skylar Urban is also in the cast – you’d have seen him at GableStage in The Whale. Of course, some of us are stuck remembering him as the title role in Stuart Little at Actors’ Playhouse because we’re old like that. Boca Mag reports that there’s a new theatre company in town – The Nicest Theatre Company. The Nicest Theatre Company—which actually derives its name from a portmanteau of its three founders’ first names, Nick Rapuano, Celine Boccia and Stephanie Suau—will launch the first show of its 2014-2015 season, “Cabaret,” this Friday at Showtime Performing Arts Theater in Boca Raton. Florida Theater On Stage reports that Palm Beach Dramaworks is committing to developing new plays over the next few years. …Hayes and Dramaworkshop chairman Mark Perlberg are certain the market for new work exists because a portion of their audience has told them so. If they do this even half as well as they’ve done everything else, we’re in for a treat. The Royal Poinciana Playhouse remains closed. 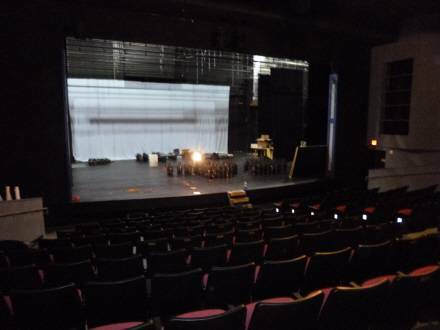 The theater, which was shut down by its then-owner Clear Channel Communications in 2004, has been in the news once or twice, but the Palm Beach Daily News reports that the property is under new management. Cooley said he hopes the new company will be more serious than Sterling has been about bringing the long-shuttered Royal Poinciana Playhouse back into operation. Sterling’s lease with the National Arts Institute to operate the Playhouse “was really nothing more than a stall tactic,” he said. The NAI still has a valid lease, although we haven’t heard much from them since they signed it.